A man holds "will work for equality" sign at the Feminist Collective event. He was one of many male students who participated. equality on April 12. With signs reading “Will Work for Equality,” approximately 50 protestors marched to the Greensburg Courthouse to raise awareness about the inequality in salaries between men and women in Westmoreland County. Seton Hill University’s (SHU) Feminist Collective Club planned the Equal Pay Day Rally with funding from the Women and Girl’s Foundation. The rally was a day-long event featuring a march from SHU to the courthouse, a rally with speakers and events at the courthouse and a tea party with a panel discussion featuring SHU professors. The rally featured speakers on the topics of equality, domestic abuse and poverty. There were also activities and giveaways. The Feminist Collective gave out bookmarks, pins and t-shirts featuring their logo and statistics on pay inequality. “It was really shocking to hear the facts and it made me want to get out there and help out more in any way that I can,” said Wytovich. “The Feminist Collective continues to provide educational programs that will raise awareness on gender issues and pay in-equity is huge,” said Maureen Vissat, associate professor of art and co-advisor of the Feminist Collective. “We certainly met our opposition some step of the way, but what matters is the cause, and I’m glad it got to happen,” said Wytovitch. 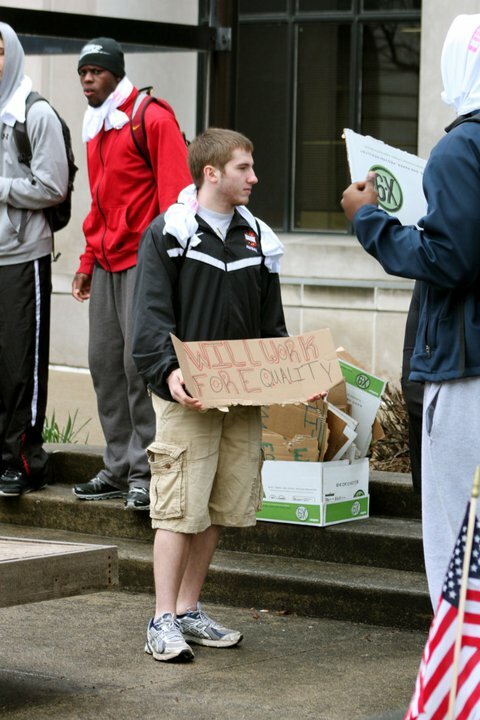 They also sponsored the “Walk a Mile in Her Shoes” event alongside the Blackburn Center in April to promote knowledge and prevention of domestic violence.